Oakridge is known as the "The Mountain Biking Capital of the Northwest," with hundreds of miles of world class mountain biking trails accessible year-round, gold-level "Ride Center" status by the International Mountain Bicycling Association (IMBA) and an enthusiastic mountain biking community. 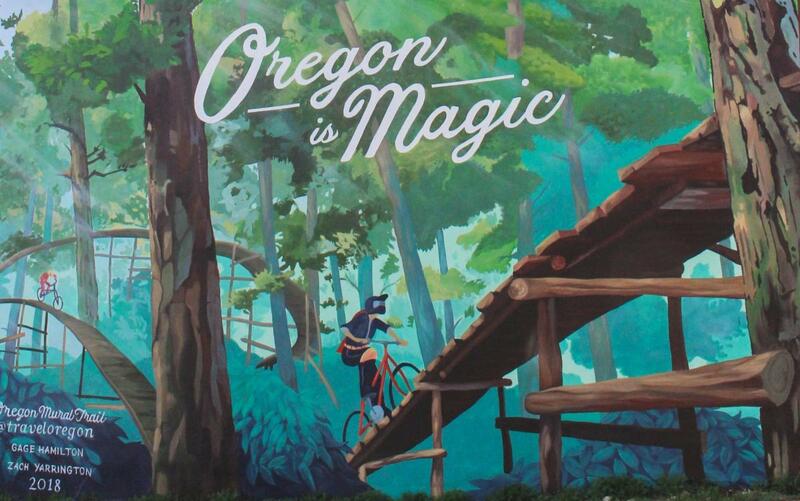 Travel Oregon launched a fantastical-styled campaign in 2018 promoting the state&apos;s attractions. Oakridge was one of seven communities first chosen for their "Oregon Mural Trail". Celebrating the community&apos;s mountain biking status and natural beauty (and lumber industry roots), Oakridge&apos;s mural showcases a mountain biker riding up a "fantasy" wooden ramp through thick forests. Visit it across from the Oakridge City Hall on 1st Street near the Brewers Union Local 180. Surrounded by large swaths of the Willamette National Forest, the area&apos;s wooded terrain sparkles with many lakes, rivers, and waterfalls. Salt Creek Falls tumbles 286 feet (87m), the second highest waterfall in Oregon after Multnomah Falls. Waldo Lake is Oregon&apos;s second largest lake (the largest is Crater Lake) and one of the world&apos;s purest. On Waldo&apos;s pristine waters motor use is restricted to electric motors only; 10 m.p.h. or less. During the summer drive or ride the scenic Aufderheide Highway (Road 19) connecting the Oakridge/Westfir area with the McKenzie River corridor further north. On this scenic road cruise through old growth forest, breathe in the rejuvenating mountain air, and relish small town explorations at either end of each 70 mile (112.65 km) leg. Less then an hour from Eugene - Springfield, this mountain town on Highway 58 is en-route to the Willamette Pass Resort ski area with a six-passenger lift that whisks you to the summit in the Cascade Mountains. The town is also host to many events from culinary festivals to mountain biking tours. Above the fog and below the snow, Oakridge offers a memorable journey into the heart of the Cascades. Around 1888 this area was a corridor for pioneers called "Big Prairie" and then "Hazeldell." The community was eventually recognized as "Oakridge" in 1912. Early on, the railroad played an important role in Oakridge&apos;s economic development and supported the growth of logging. Adjacent Oakridge, Westfir sprang up as a Western Lumber "company town" in 1923. The lumber company changed hands several times becoming Westfir Lumber Company, Blythe and Company, and finally Edwards Hines Lumber Company. The historic Office Covered Bridge, Oregon&apos;s longest covered bridge, was built across the North Fork Middle Fork Willamette River to connect the Westfir Lumber Company mill to the office (now a bed and breakfast). In 1948, the Pope and Talbot Timber company operated a sawmill in Oakridge. Once considered the heart of the timber empire, Oakridge&apos;s economy faltered after the industry collapse in the early 80s. The two local saw mills were both shut down by 1985. Today, outdoor enthusiasts have remade the area into a hot spot of their own. Oakridge has become the watering-hole for big adventures with comfortable lodging, a popular local brewery, and headquarters for guides and equipment rentals. You can take your Off Highway Vehicle (OHV) for a spin in designated areas or visit a local distillery to taste spirits infused with Douglas fir tips. There is even a local golf course and airport. And the locals want to see you! Many front line staff have undergone certification to participate in the We Speak Oakridge program, a community effort to share insider area knowledge with visitors. Westfir is now known as a "Quiet Little Town in a Beautiful Place." Discover the inspiring beauty and endless recreational opportunities all around Oakridge/Westfir.